Ambala Division is the proud custodian of "WORLD HERITAGE SITE-KALKA SHIMLA RAILWAY". 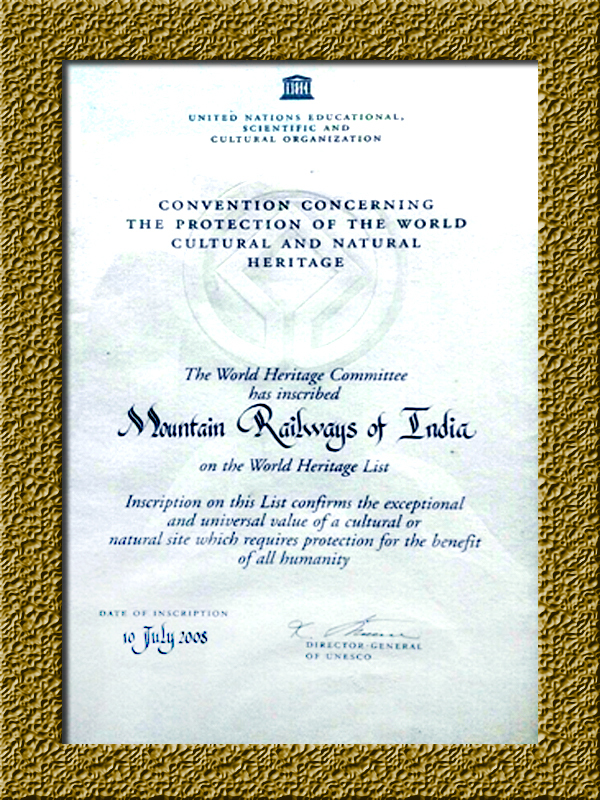 The heritage status to KSR was awarded on 10 th July, 2008 by UNESCO. Shimla (then spelt Simla) was settled by the British shortly after the first Anglo- Gurkha war and is located at 7,116 feet(2,169m) in the foothills of the Himalaya. By the 1830s, Shimla had already developed as a major base for the British. It became the summer capital of British India in 1864, and also the Headquarters of the British army in India. The Kalka- Shimla Railway was built to connect Shimla, the summer capital of India during the British Raj, with the Indian rail system. "The Guinness Book of Rail facts & feats" records Kalka Shimla Railways as the greatest narrow gauge engineering in India. It is indeed true, construction of 103 tunnels (102 Existing) aggregating five miles and over 800 bridge in three years, that too in rough and hostile terrain was not an easy task. The Historic, approximate 115 years old KLK-SML Railway line which was opened for public traffic on 9 th Nov.1903, became UNESCO Declared world Heritage Railway line, when it was conferred Heritage status on 10 th July 2008 & listed under "Mountain Railways of India". The idea of a Railway line to Shimla dates back to the introduction of Railways in India. It is said that in The DELHI GAZETTE, a correspondent in November, 1847 sketched the route of railway to Shimla with the estimates of the traffic returns etc in appropriate style. It is interesting to note that Kalka Shimla line was most surveyed line. It is believed that Baba Bhalkhu a local saint, who possessed some supernatural engineering skills, helped the British engineers in laying down this track. In dedication to his services, Railway has named a Museum as BABA BHALKHU RAIL MUSEUM at SML. This Museum depicts the way of life of KALKA-SHIMLA Railway section through a collection of extremely rare artifacts accumulated over the decades. The collection has been displayed in the most authentic manner. The line measuring 95.68 KM from Kalka to Shimla was opened for traffic on Nov.9, 1903. This line was further extended from Shimla to Shimla Goods (The old Bullock cart office) on June 27, 1909 making it 96.57 KM. An interesting feature of this line was complete absence of Girder Bridges initially. Multi Arched Galleries, like ancient Roman Aqueduct being the commonest mean of carrying the lines over the ravines between the hills. A few of the bridges are unique, specially Bridge No 226 & 541 remained most spectacular bridges of this section throughout this period and can be seen in many photographs of this section. Similarly a few tunnels are also unique. Initially there were 103 tunnels, but 102 exist, as tunnel number 46 does not exist now. Out of these 102 tunnels, Barog Tunnel (No 33) 3752 feet long (It is the longest Tunnels of Kalka Shimla Railway line) requires special mention. The Delhi Ambala Railway Company was in serious financial crisis due to high maintenance cost of this section. So on representation of the company the Secretary of the state decided to purchase this line and the purchase was affected from 1 st Jan. 1906. Kalka Shimla Railway was managed as an independent unit from the NWR office Lahore till 1926. Later on the management of Kalka-Shimla line was transferred to Delhi Division. Since July 1987, this is being managed from Ambala Cantt. The first two steam locomotives approved on Kalka Shimla Railway were from Sharp Stewart and Company Limited of Glasgow, built in 1900 & 1902 respectively. One steam locomotive (No KC-520) built in 1905 is still surviving and can be seen on this track. The ultimate in Luxury travel reached Kalka Shimla Railway when Rail motor car was introduced on this section. The earliest rail motor cars on Kalka Shimla Section were petrol driven supplied by B.DREWERY CAR CO. LTD/London. The four rail motor cars (i.e No 1, 2, 3 & 4) working on this section were 1927 built repower packed in 2001 with Leyland engines. Diesel Traction was introduced on this line in 1956 with the procurement of 5DZ (Later ZDM-1) class locomotives built by M/s A. JUNG of Germany. The first lot of carriage built for Kalka Shimla Railway in 1903 was small four wheeler measuring 17 feet from Buffer to Buffer. One can however see a few vintage old coaches and wagons still plying on Kalka Shimla line. Rolling stock on this section is nicely maintained. In 1905 Kalka Shimla Railway obtained its first traveling crane for attending accidents. This 10.T break down crane was manually operated built by M/s Cowans Sheldon of U.K. It was a beautiful piece since condemned. No doubt this exotic Railway section is stunningly beautiful. Sometimes it faces vagaries of nature also. Peak winter season and rainy season are the most trying period for a railway man working on this section. The snowfall of moderate intensity is very common on this section, in December and January. Snow cutters are attached on the engine to clear the snow in winter. However the first heavy snow fall this section faced was on Dec.26, 1903. The traffic remained suspended for two days. The heaviest snow fall since this railway line came into existence was during first eleven days of Jan 1945. The Rail traffic remained disrupted up till Jan 14, 1945. Slips and landslides are also quite common on Kalka - Shimla section of Railway. The most serious settlement occurred in 1978 and 2007 respectively. In August, 2007 heavy down pour washed away part of Koti station building. Track was put into service after many days. Kalka Shimla Track has also played an important role in the history of subcontinent. In 1930 Mahatma Gandhi traveled by this track to meet Lord Irwin. Late Dr. Shankar Dayal Sharma/Ex President Of India always preferred Kalka Shimla Rail Journey while going to Shimla. All the stations are quite neat and clean, but Barog station is eye catching and stunningly beautiful. The restaurant of Barog Railway Station is one of the oldest and still maintained with oldest atmosphere. According to legend the Barog station is named after British Engineer Mr. Barog, who was working on this railway project. Time has changed a lot. With the passage of time, train journey between Kalka Shimla has become more convenient. Luxurious coaches and trains have been introduced in making KLk- SML rail journey more memorable. Putting the Rails on arduous slopes of Shivalik hills that too in hostile conditions, more than 115 years ago; truly Kalka Shimla is the finest example of greatest narrow gauge engineering skills. It is a salute to both men and mountains, as Great Things happen when two meet.